You can easily make ice-cream at home without owning an ice-cream maker. I chance upon this Chinese translated ice-cream recipe book written by a Korean who owns a patisserie - BaQueen. The first recipe which I tried from the book is the Matcha ice-cream as my daughter and I love Matcha desserts. 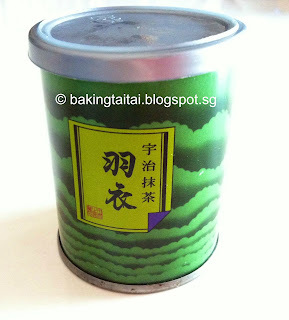 This dessert turns out to be superlicious and if you are a matcha lover like me, you must give this a try! No regrets! Just to share that I am quite particular when it comes to choosing the type of Matcha powder to be used in baking or making desserts. I prefer to use premium grade like the one shown in the photo below. You can find it in most Japanese supermarkets or our local Finest supermarkets. 1) Put fresh milk & fresh whipping cream into a metal bowl, cook till you see some bubbles at the side of bowl. Off fire and set aside. 2) In another metal bowl, add 2 egg yolks & granulated sugar. Use a hand whisk to mix well. 4) Pour the mixture into a sieve or strainer over a metal bowl. Put this metal bowl over a bigger container filled with ice. Use the hand whisk to mix the mixture rapidly till the temperature lowers to about 5 degrees celcius. This is to ensure the bacteria are killed totally. 6) Transfer the mixture into a freezer safe container and place it in the freezer. Remove every hour to stir with a fork 3~4 times as this will improve the texture and prevents the ice-cream from being icy. Ice-cream is ready when it hardens. Chinese Recipe is adapted from 金兑恩's ice-cream recipe book and translated to English for my English readers. Photos (updated on 13 Feb 2014) are personally taken by baking taitai with an iphone, sometimes with just one hand while working with the other.